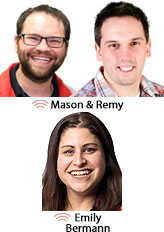 iHeartMedia WEBG/Chicago morning hosts Mason and Remy have exited, as has APD/split midday host Emily Bermann. The departures follow that of PD/split-middayer Steve Stewart, who has been succeeded as PD by iHeart WBWL/Boston's Lance Houston, as reported this morning via Breaking News. Morning co-host Alabama remains in place. Like Stewart, Mason & Remy had been with station since its 2015 launch (Breaking News 1/9/15, CAT 1/13/15). Bermann joined three months later (CAT 4/8/15). Reach Stewart here and Bermann here. Houston joined WBWL from WPOC/Baltimore in 2014 (Breaking News 8/25/14) with prior stops in Atlanta, Montgomery, AL and Gainesville, FL. Reach him here. No word yet on plans for the position in Boston, nor regarding the full on-air lineup in Chicago.